All 85 colors available in 125ml and 1000ml sizes at discount prices. Dupont French Silk Dyes are very popular throughout the world and are used by many professional silk artists because of the wide color range and intensity of colors offered, the permanence of the dye, and the superior way they lend themselves to salt and watercolor techniques. These are very concentrated dyes which should always be diluted before use. Steam to set. Recently, the company that manufactures Dupont Silk Dyes and Alter Ego Dyes changed hands and reorganized their entire line. The range of colors they offer has been reduced from 120 colors to 80, and the sizes have changed to 125ml and 1000ml. We stock the 125ml bottles in house, and the liters are available by special order. 125 ml - Sorry, this item is temporarily sold out. Dupont Silk Dyes are considered by some to be the best silk dyes in the world. Others think Tinfix or another brand is the best. Different strokes, different folks. Dupont dyes have been made by Mr. Dupont in France for 60 years (he must be getting very tired) and are the dye of choice for many because of the wide range and intensity of colors offered, the permanence of the dye and the superior way they lend themselves to salt and watercolor techniques. These are very concentrated dyes which should always be diluted before use. For silk, dilute with the dilutant above for best results, or if you don't care if it is streaky, an alcohol/water mixture. For wool, Dupont recommends using at least 50% Industrial Alcohol. Depending on the shade desired, dilute from 10% to as much as 50%. When you realize how concentrated they are, they become more reasonable in price. Dupont dyes are manufactured without Aniline but do contain Alcohol for a preservative. Dupont dyes must be set by steaming (1-4 hours, depending on the type of fabric and thickness of the roll), and once set, can be washed, drycleaned and are light resistant. The Dupont color chart shows 80 colors. Many are too close to tell apart. We have a color chart in our catalog. In addition, all of the colors can be mixed to produce your own range of unique colors. For the most even results, use this product mixed with water to thin Dupont Dyes and achieve a variety of color gradients. The Serti (closing or fence) technique is the silk painting technique where designs are outlined with gutta or water-based resists, which are applied to white silk that has been pre-washed, dried and stretched (on a stretcher). Once the gutta or water-based resist has dried, it acts as a barrier for the dye or paint; keeping the color within the outlined areas of the design and allowing you to achieve sharply defined borders. After the dye or paint has been properly set, the clear gutta or resist is removed and a defining line the color of the original fabric remains. Colored guttas and resists are also available that are meant to remain in the fabric. Pre-wash your silk by hand or in the washing machine on a gentle cycle with warm water and Synthrapol. Rinse, dry and, when still slightly damp, press with an iron set to the silk setting. The Serti Technique lends itself well to designs with enclosed areas where the color will be contained within the resist lines. Draw your design to scale on a piece of paper, first in pencil and then go over it with a black marker, this will be your template. Lay your silk on top of the template and with a pencil or vanishing marker, lightly draw your design onto the silk. With thick silks you may have to draw free hand but having your template will still help. You will need a frame to stretch your silk and suspend it off the table. There are a variety of types of frames you can use, depending on the size of the piece you are painting, your budget and what is available. Artist's canvas stretcher bars work very well and are sold at most art supply stores. Your frame needs to be soft enough to allow push pins or 3-pronged tacks to be pushed into it OR you can create a 'trampoline' effect with rubber bands and hooks or silk clips (see below). The last method is best if you are painting a piece that has pre-finished edges, make sure that the inside measurements of the frame, are at least 2-3 inches larger than the silk to avoid leaving bleed marks on the hem. In a pinch, you could also cut out a frame from a cardboard box. Stretch your silk onto your frame with pins, silk thumb tacks or hooks spaced every 4-6 inches along each side. If need be, you can link rubber bands together for extended lengths. Rubber bands are great because they will maintain the tension of the silk for you. The goal when stretching your silk is to create just enough tension so that the silk remains taut while you are painting but not so tight that it tears. Your piece may sag a bit once it becomes wet with dye or paint so you may need to adjust the pinning as you are painting. Placing upside down plastic cups or wood blocks underneath each corner of your frame will raise your frame a few inches above your table so that the silk does not have anything touching it. Fill your applicator bottle with resist and make sure the tip is on properly. Hold the applicator bottle vertically with the tip touching the silk. Using even pressure and a steady hand, draw your resist lines. Be sure there are no breaks or gaps in the lines, or dye will escape. Also check the back side of your piece to make sure the resist has penetrated all the way through. If it hasn't, dye can bleed under your resist lines so you will need to apply resist to the back side as well (this is more often necessary when working on silks heavier than 12 mm). Let the resist dry before painting (you can speed up the drying time with a blow dryer or heat gun). Dip your brush into the color and apply the dye or paint sparingly to the center of an outlined area by touching the brush to the silk. Let the paint move to the resist line - do not apply the paint too close to the resist as water-based resist may begin to dissolve if the line becomes too saturated. If there is a gap in your resist line that you didn't notice and the dye or paint starts escaping, you can stop the movement by drying it quickly with a hair dryer and then patch up the line with gutta or resist and let dry before resuming. When painting large areas such as backgrounds, work quickly, applying wet to wet to avoid unwanted lines. When you have finished applying dye or paint to silk yardage or a scarf, note that it is not permanent until you "set" or "fix" the color. In other words, the color will all wash out if it is not "fixed". The method of "setting" or "fixing" the color depends on the chemistry of the dye or paint you are using. Before purchasing any dye or paint, you should read the directions thoroughly to determine if the required procedure fits your project and situation. Of the two methods for setting silk dyes, the steaming method produces the most brilliant colors. Some people don't want to go this route, but those who do are usually very happy with the results. Read detailed steaming instructions. Allow to dry 24 hours before heat-setting the paints with an iron. Iron each area of your piece for 2-3 minutes, face down on your ironing board with a press cloth between the silk and iron. You may want a protective cloth on the ironing board as well. Work in small areas at a time, moving in a small circular motion so as not to burn the silk, but also so that each section retains the heat for a long enough duration to actually set the paint. If you don't want to go the steaming route, Tinfix and Jacquard have liquid fixatives for their respective dyes. They can be painted on top of the dyes, or the project can be submerged. Although much easier, the colors will not be as brilliant and may not be as colorfast as they would if set by steaming. Follow the manufacturer's directions for using the chemical fixatives. Once the dye or paint has been properly fixed, it's time to remove the gutta or resist. Clear gutta is removed by dry cleaning. Clear water-based resist is removed by rinsing in warm water. It comes out easily when used with iron-set paints, but some brands can be very difficult, if not impossible, to remove after steam-setting dyes. Once the resist is removed, hang dry, then iron lightly while still slightly damp. See our "Gutta vs. Resist" page for more details. If colored guttas have been used, do not dry clean (the color will come out with the gutta)! They are meant to stay in the silk, and there will be some "hand" or "feel" to the lines in the silk. Some people prefer to use the colored guttas on wall hanging pieces only, rather than on wearable art. If colored water-based resists have been used, follow the manufacturer's instructions for heat-setting with an iron before painting on the color. See our "Gutta vs. Resist" page for details. The colored resists are meant to stay in the fabric, and there will be a "feel" to resist lines. Detailed patterns without resists can be achieved by priming the prewashed and stretched silk with a stop-flow primer which is left to dry before painting on the dyes or paints. Stop-flow, or No-flow primers cause the color to stay put rather than migrating. This allows for freehand painting without gutta or water-soluble resists. Think of stop-flow primers as starch-like sizing to prepare the canvas with. They wash out in the end. Watercolor Effects can be achieved by applying dye or paint to silk that has been pre-washed and put on stretcher bars whether or not you are using resists (but not if you are using stop-flow). Dyes or paints are applied to the silk with a paint brush, mist sprayer, eye dropper or other tools to achieve abstract effects. Spraying the silk lightly with water before adding color increases the flow of the dye or paint. Sprinkling silk salt on the piece when still wet and leaving untill completely dry before brushing off the salt, produces interesting textural effects. Applying alcohol to dye-painted silk can also create beautiful effects. When you have finished applying the dye to the silk or wool yardage or scarf - it's not permanent until you do something else. You have to "set" or"'fix" the color so you can wash or dry clean the piece without all the color washing out. The method of "setting" or "fixing" the color depends on the chemistry of the dye you are using. Before purchasing any dye you should read the directions thoroughly to determine if the required proceedure fits your project and situation (time or space available, inclinations i.e. lifestyle). You will also learn how that particular dye or paint needs to be fixed (set, made permanent). The flowable paints (Dynaflow, Setasilk) - only ironing. Jacquard Silk and Tinfix Design can be set using steam or a special liquid fixative. Jacquard Silk, and especially Tinfix Design, yield deeper richer colors when steamed as opposed to being fixed with the liquid fixative. Dupont and Vinyl Sulphone dyes require steaming to set the color. Steam fixation is essential for the last group of dyes and preferred for many others. They need to be steamed to achieve adequate color intensity and washability. The high temperature heat and pressure produced by steaming bonds dye and silk molecules together. Best results are achieved using a professional home steamer. Dharma carries two types: the upright electric self-contained steamer and the stove top steamer. Smaller pieces can, however, be steamed successfully on the stove much like one steams vegetables, and we have directions for making a steamer out of a household pot here. When steaming it is important that the fabric does not touch itself at any point. If it does, the dye will transfer from one place to another and cause smearing. Also, water from the steaming process can never be allowed to come into contact with dyed silk. This will create spots and smears and designs you may not desire. To prevent these unwanted effects the fabric must be wrapped or rolled in paper and protected from itself and condensation from the steamer. Rolling the fabric for the electric steamer or the stove top steamer. The silk should be rolled between sheets of newsprint or similarly absorbent material - the paper or material you use must be porous enough to allow the steam to penetrate. If you use newspaper, the ink must be completely dry, at least six weeks old. Roll a few layers of paper onto the pole you are using. Then begin rolling the fabric onto the poll between the layers of paper while keeping it smooth to prevent wrinkles from developing. The paper should extend at least two inches beyond the silk at each end. The length of the paper you use is not important as it can be overlapped. You can roll one piece of fabric or many scarves. Continue rolling until all the fabric is on the roll. Finish by wrapping an extra two layers of paper around the fabric and secure the roll with tape. Place the roll in the steamer and you are ready to start. The length of time required to set the dyes depends on the type of dyes and the amount of fabric on the roll. Generally, steam time will range from 30-45 minutes (for reactive dyes like Vinyl Sulphone) - after the water is boiling - to 2-3 hours for the French dyes and Jacquard Silk. The larger the roll of fabric, the more time necessary, as the steam must penetrate to the center of the roll. Be sure to keep the temperature steady and constant. Check the directions of the dye you are using for the correct/ appropriate steaming time and then adjust for the amount of fabric being steamed- the more fabric, the longer the time. Can I use different silk dyes or paints in the same piece? Do I need to use the dye-thinner/dilutant for the Dupont dyes? The dilutants for the silk dyes will allow you to thin the dyes and aids in the uniform spreading and merging of the dyes, avoiding hard lines and watermarks. If you just want to dilute the color and want a streaky appearance, just use water. An alternative is the use of alcohol(Isopropyl rubbing) and distilled water in a 50/50 proportion. A drawback to the alcohol dilutant is the odor of the alcohol and good ventilation is needed. 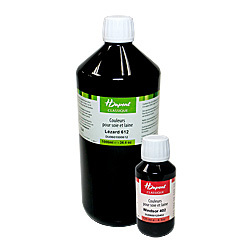 Use this product to thin and dilute Dupont Silk Dyes. Mix 1 to 2 tablespoons with one quart of water. Shake it well and then keep on hand and use it as needed. I have been painting with Dupont dyes for almost thirty years. The new formulation is such a disappointment! I am so happy that I haven't ordered any liter bottles. These dyes are much weaker and less reactive to salt. Taupe used to be one of my customer's favorites. Their Taupe is a dirty purple with a yellow-brown undertone instead of the rich deep violet-brown of old. My experience with these formulations will make it easy to move on to another dye house. 28 of 28 users found this review helpful. Luminous colors great dye for textural techniques like salt or alcohol. Love it!! 14 of 14 users found this review helpful. These are the best I've used... Outstanding colors and predictable results. If I don't feel like mixing the colors with the Jacquard dyes then this is my go-to dye. The colors are vibrant and they can be endlessly thinned to be a soft wash of color. Steaming is so wonderful and even though I tend to be a pot opener I've never had the paper get so wet the dye migrates to another scarf. I would like to chalk that up to something I did but it's the dye. These are worth the money every time. 6 of 7 users found this review helpful. The only dyes I am working with because of their very high concentration of pigments. The only dyes I am working with because of their very high concentration of pigments. The colours are gorgeous. Most wonderful dyes available! Highly concentrated pigments! I love the brightness and versatility of these dyes. Chamois and yellow makes a very pretty straw color. Chamois by itself..meh.